A train carrying mail leaves the Oakland Mole in this headline shot of the John Illman exhibit. 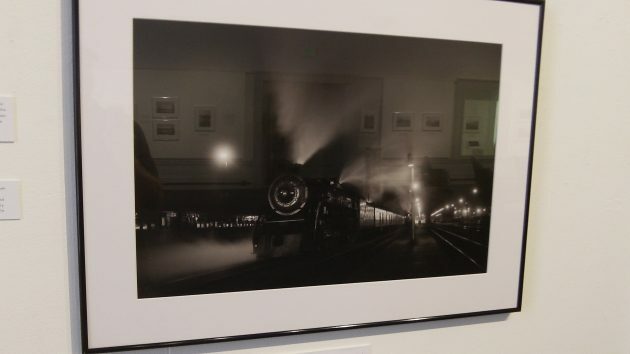 If you’re at all interested in railroads and photography, you don’t want to miss an exhibit now on display at the Benton County Historical Museum in Philomath. Better get a move on, though. The show has been running since July 15, and Aug. 20 will be its last day. I stopped by on Friday on my way through Philomath. I had read about the show some weeks ago in a press release from Benton County. It’s called “Documenting the end of the Age of Steam,” and it includes about 50 of the black and white photographs of the late John C. Illman, an organic chemist by profession, who died in 2013 at the age 92. The photos show a wide variety of steam and diesel-electric locomotives pulling freight and passenger trains in various locations on the west side of North America. Among them is a shot of the inaugural run of the Southern Pacific’s Shasta Daylight out of Oakland in 1949. Illman took the photograph at a place called Giant, near Richmond, Calif., as the train began its run toward Oregon and Portland. Even though it’s black and white, people who remember the orange color scheme of the SP’s Daylight trains have no trouble recognizing the design. I was glad to see that the curators of the exhibit included a shot of the back of Adlai Stevenson’s campaign train as it made a stop in Niles, Calif., in 1952. Stevenson was not shown. The rear platform, from where candidates would address local crowds as their trains made their way across the country, was empty. Still, the shot was a quaint reminder of an era when Americans got to choose among presidential candidates — Ike was the other one that year — who were not generally known as self-aggrandizing bullies or money-grubbing crooks. There is lots of good stuff to see in this show, handsomely arranged on the museum’s second floor. The photos are accompanied by detailed captions, so you know what you’re looking at. Upstairs at the Benton County Museum in Philomath. 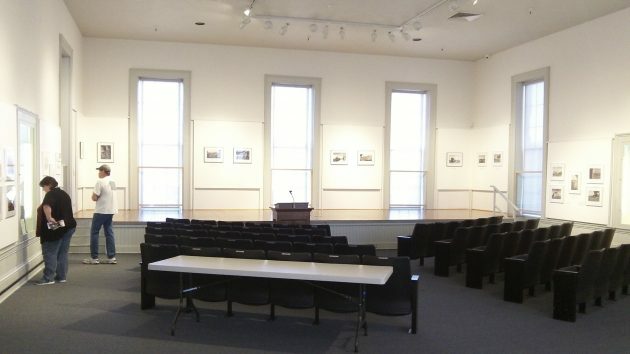 Checked the Shasta Daylight Schedule on Internet, and it did stop in Albany. Hasso: Yes, the SP Shasta Daylight stopped at Albany as all scheduled passenger trains did.